A biography of Queen Eleanor of Provence can be found here together with many of her letters. She remains the only English queen whose exact final resting place is unknown and remains without memorial. and what is known of her relationship with Amesbury Priory I wish to explore briefly in this post. In the 1280s, in her usual practical way, Queen Eleanor made arrangements to take the veil at the nunnery at Amesbury Priory. In May 1280, the king ordered ten oaks be delivered from Chute Forest to the prioress of the priory ‘for certain works’ that Queen Eleanor, the king’s mother, was causing to be made at Amesbury, and a further 20 oaks were ordered from Clarendon. In 1281, a further 15 Oaks from Chute and 12 from Melksham were cut down for her projects at Amesbury. She arranged for her namesake, Eleanor, daughter of Beatrice of Brittany, and Mary, sixth daughter of Edward I, to enter the priory just before her. 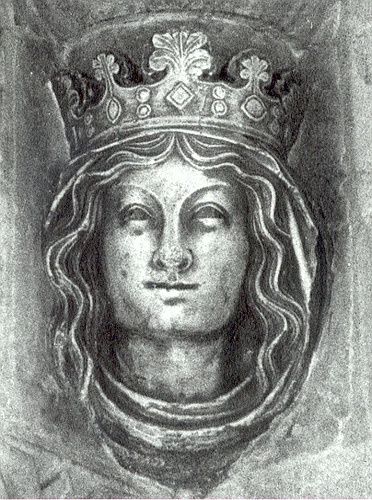 Eleanor of Brittany, in her tenth year, was veiled at Amesbury on 25 March 1285 and Mary, at the age of seven, entered on 15 August 1285, along with thirteen other girls from aristocratic families, in a ceremony attended by the king and queen, bishops, abbots, priors and lay magnates. From the outset, Mary was amply endowed with lands from the Crown, further estates and gifts of fuel and wine. Mary subsequently spent her whole life as a nun at Amesbury Priory. This preserved a close connection between the priory and the Crown, and the convent benefited permanently from the endowments of its illustrious inmates. Queen Eleanor made her entry into the convent quietly on 7 July 1286, while her son Edward I and her daughter-in-law (Eleanor of Castile) were on a prolonged visit to Gascony. Amesbury Priory was a daughter house of the abbey of Fontevrault in France. In the mid-thirteenth century, it consisted of sixteen lay brothers, six chaplains, headed by a prior to care for the needs of a prioress and seventy-six nuns. Eleanor, daughter of Beatrice of Brittany, who took the veil aged ten on 25 March 1285 at Amesbury, later became an abbess of Fontevrault. Queen Eleanor appears to have chosen Amesbury in Wiltshire over Fontevrault in France, as she had made England her home, and it was where she had spent the majority of her life. She continued to exercise a matriarchal role in ‘affairs of the nation’ after entering the priory. Henry III (Queen Eleanor’s husband) had promised that his heart would be buried at Fontevrault where his mother Isabella of Angouleme was buried, and it appears that Queen Eleanor would not let this happen during her lifetime. She was by all accounts devoted to her husband’s memory and clearly had good reasons of her own to defy his express wish during her own lifetime. His heart was eventually handed over to the abbess of Fontevrault after the death of Queen Eleanor in a ceremony in the abbey church at Westminster on 10 December 1291. Queen Eleanor’s daughter-in-law, Eleanor of Castile (married to her son Edward I), died unexpectedly at Harby near Lincoln on 28 November 1290. Edward embarked upon an immediate and unparallelled commemoration of his queen. At each of the twelve places her bier rested on its journey from Lincoln to Westminster, a site was marked out for the future erection of a memorial cross, which subsequently became known as Eleanor crosses. Unfortunately only three now remain standing. It is said that no other English monarch or consort before or since has been honoured in death so lavishly or so beautifully as Eleanor of Castile. She was buried at the foot of her father-in-law Henry III’s tomb in Westminster Abbey in sepulcro Henrici regis . Edward arranged for her entrails to be buried in Lincoln cathedral before her funeral cortege began its slow procession to London. For the tombs at Lincoln and Westminster, he commissioned the English goldsmith William Torel to produce two life-size gilded bronze effigies, at the time an innovation in English funerary art. 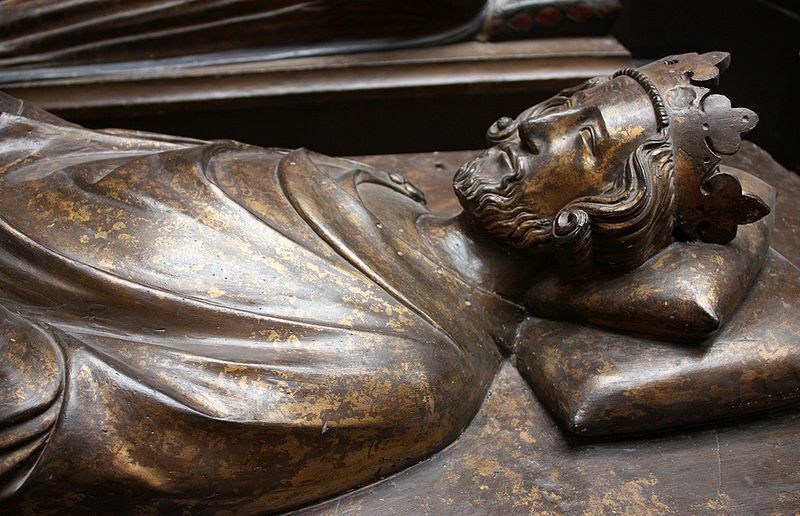 Edward commissioned a similar life-size effigy of his father Henry III for completion at the latest by May 1291. The final effigies were hailed at the time as true masterpieces of craftsmanship. Edward’s tribute to his beloved wife, who died so unexpectedly, and his father, are now recognised as the dynastic peak of the English Plantagenet kings. Seven months after losing his wife, Edward’s mother, Queen Eleanor of Provence, died at Amesbury priory on 24 June 1291. Edward’s final visit to his mother at the priory was in February 1291 and it is likely that he would have told her of his plans for the elaborate tombs he commissioned for his father and wife. I wonder if they touched on the subject of the burial plans for Queen Eleanor at that meeting, as she died only four months later. Previously, in 1246, Queen Eleanor had recorded her wish for burial at Westminster Abbey also. Her husband and daughter Katherine, who predeceased Queen Eleanor, were both buried in Westminster Abbey. She is known to have been loyal to the memory of her husband. This begs the question of why she chose a small provincial priory in Wiltshire for her final resting place over the usual temporal and spiritual splendor of Westminster Abbey afforded naturally to kings and queens of England. Eleanor’s heart was buried at the church of the Franciscans in London, where her daughter Beatrice, who died in 1275, had been earlier buried. Edward I was in Scotland at the time of his mother’s death and the nuns at the priory, unsure of his wishes for her body, embalmed it and had it secretly stored until the king’s return, according to the Osney chronicler. The prioress at Fontevrault wrote to Edward I asking that his mother be buried in France. An official of Henry of Eastry, prior of Canterbury, informed Prior Eastry in a letter at the time that Lord Edmund was on his way to London ‘for the burial of his mother’, but the writer adds that he did not yet know whether the queen mother should be buried debeat sepeliri in London or at Amesbury. 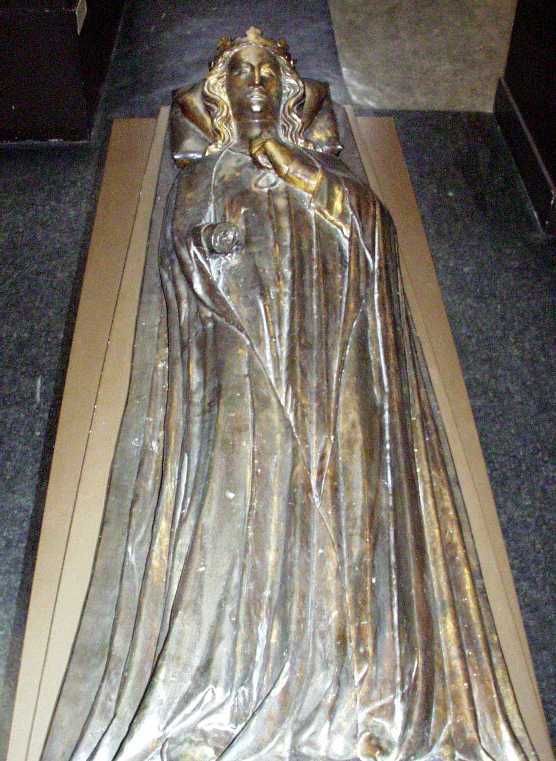 Eleanor of Provence was buried 45 days after her death on 8 September 1291 at Amesbury. Edward I attended with his brother Edmund and a large gathering of magnates and prelates. The Lanercost Chronicle states Edward handed the gold-encased heart of his mother, which he described as a treasure most dear to him, to the Franciscan Minister General for burial in the London Church of the Franciscans. The body of Queen Eleanor of Provence was buried under the High Altar at Amesbury. The nuns of Amesbury priory stated in 1327 that at the request of Edward I, they had provided a daily celebration for his mother for the last thirty-six years. Edward had originally promised an endowment of £100 a year to establish this, although paid nothing (Calendar of Inquisitions Miscellaneous ii no 1002). Whatever memorials were erected to Eleanor at Amesbury and the Franciscan church in London were destroyed by the subsequent king, Henry VIII, during the dissolution of the monasteries nearly two hundred and fifty years later. In November 1871, when William Torsels exquisite effigy of King Henry III was lifted for an inspection of the tomb in the Chapel of the Kings at Westminster, a small delicate engraving was found on the underside. The engraver had drawn a crowned and veiled image of a queen, together with a young nun; their hands lifted in prayer to a larger, unfinished figure. This is now accepted as a representation of Queen Eleanor with one of her grand-daughters, and the unfinished figure, the virgin Mary. Queen Eleanor of Provence venustissima the only queen of England without a marked grave. My heartfelt thanks, as ever to the Cornelius Reid family, and to Margaret Howell , whose definitive biography of ‘ Eleanor of Provence Queenship in the Thirteenth Century ‘ has been the source of much of the factual information considered here.